Don’t get me wrong, i am an adventure Junkie by no means. But the idea of wading through muddy waters flanked by steep red canyon cliffs on either side was an adventure i was willing to embark upon. The ‘narrows trail hike’ at Zion National Park is one of the best ways to get close to nature’s ever evolving nature. A majority of my millennial friends believe that there is little reason to wait until our golden years to see the world. The world is traveling the world at a pace not seen previously. No wonder then that Zion national park had more than 4.3 Million visitors last year which is a 60% increase in the last decade. 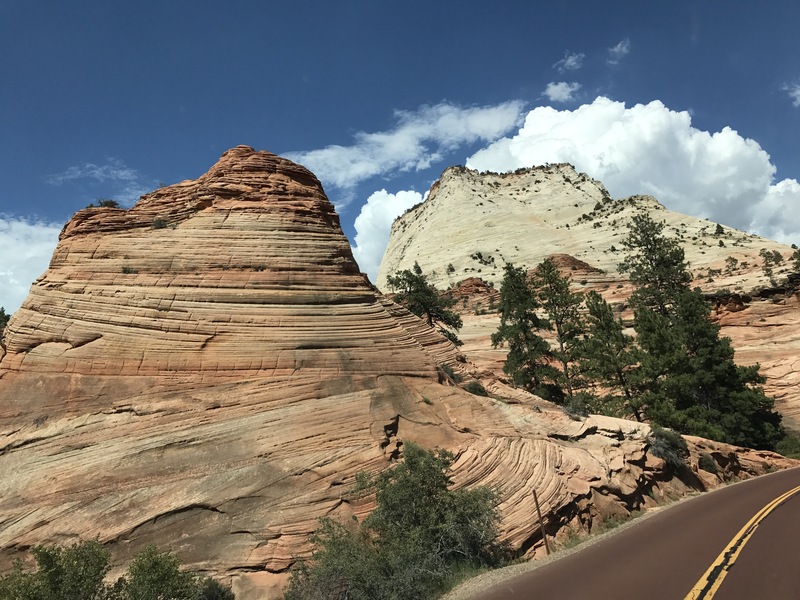 Zion national park in south west Utah is best reached by flying into Las Vegas, driving to and staying over night at the town of Kanab in Utah. The drive through the park will begin with limitless expanses of fields where majestic American Buffalo roam about. Zion is popular for its incredibly adventurous virgin river gorge hikes, scenic emerald pools, and picturesque red cliff canyons. They leave you mesmerized about the expanse of time and space and how minuscule a part of it all you are. Insignificant really. Even pictures through the car’s windshield look magnificent around every bend. They do little justice to what you experience through your naked eye. If your visit to Zion is to traverse the park prescribed shuttle buses, you should get there super early to beat the crowds and get a parking spot. But if you are adventurous enough to hike the day long narrows trail, you need to enter into a lottery a couple of months prior to the visit or in the last minute lottery which opens up a few reserved seats. If you do win the lottery, you are better off picking up your tickets the evening before to avoid early morning lines which is what we did. This way you can also sleep in a little later the morning of the hike! Zion has vey strict caps on how many people can enter the park at any given time especially since the trails are prone to fatal flash floods. Pay absolute heed to park rangers and flash flood warnings before you set on the hike. Flash-floods can strike even if its a beautiful sunny clear day. Expert tip: Always carry your phone in zip-locks. If it falls in the water you may find it downstream after an hour. #TrueStory. Making human chains is a good idea! Make sure to carry enough food, water, torch lights and a first aid kit because getting stuck in a flood without these can be a mistake. Waterproof hiking shoes are a must. We did just fine without walking sticks, but am sure they help. You can find them on rent at Kanab. Please keep aside a whole day to hike the gorgeous narrows trail gorge. You will be tired by the end of the day and would want to just rest. But its a trip well worth the effort! Pure solitude, a sense of adventure, or a fun challenge. No matter what it is you come looking for at Zion, you will find it in the end. Check out my previous post on Canyonlands National Park! Coming soon adventures in Bryce Canyon National Park! Pingback: Yellowstone National park – 7 of 59 – Life on a post-it!